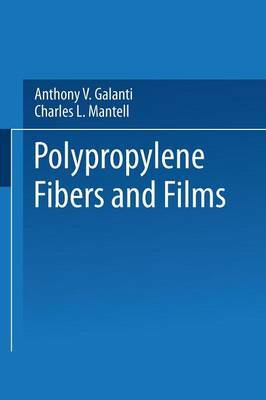 This book represents a compilation and correlation of pertinent information currently available on polypropylene fibers and films. Specifically. the information presented con- siders the effects of fiber and film processing conditions upon polypropylene fiber properties as well as the engineering properties of polypropylene relative to other commercial fibers. The data on polypropylene fibers were obtained almost entirely from recent technical periodicals. reports. and technical literature of various polypropylene manufacturers. Since much of the originalworkonpolypropylenewas conducted by the Montecatini Company in Italy. several pertinent trade journals were foreign-based and required translation. Ref- erence is made to sources of information indicated in the appended list of references for the tables and figures; many figures were reproduced as they appeared in the original articles. When available, the origin of a fiber used in a specific analysis is presented by indicating the manufacturer's trade- mark; a list of thesetrademarks as wellas several definitions are given in the appended section "Definitions and Fiber Trademarks." The more general term "fiber" is used in the work to include both monofilaments which are relatively coarse fibers approximately 40-1000 den, and textile fibers which have a denier between 1-15. Multifilament yarns consist of a group of textile fibers assembled together to form a single thread. Since fibers are Widely utilized in theform of yarns. consider- able information on the properties of various yarns relative to polypropylene yarn is presented.